A simple system for getting clean water. You can use it as a squeeze system on the trail or as a gravity-fed, hand-free system once you're in camp. Just connect the dirty water source to the filter and the gravity pipe cleans water out the other end. Includes an MSR TrailShot filter and two 2L MSR Dromedary bags, labeled "clean" and "dirty", plus a connector hose. Compact silicone bulb pump is easy to use and only requires 1 hand. Long hose keeps you out of the dirt, when drinking from the source. Hollow-fibre filtration system is easy to clean, and pumps with little resistance. Water quality will significantly affect the filter's life. Filter mouthpiece has a debris cover to keep things clean. 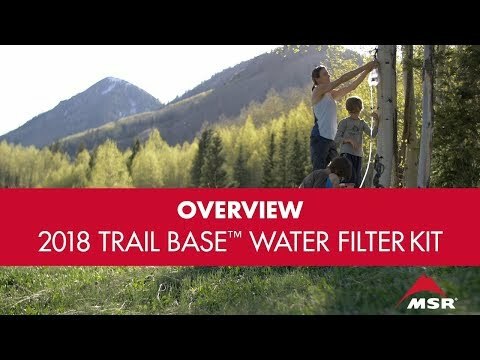 Filter cleans with an easy shake.